Referring to the one thru the door in the long tunnel on BOF road, where that accidental death occurred awhile back? Is there a name for that point? I am interested too. A quick search for man dies in yosemite tunnel came up with nothing related. Yea, I'm probably mistaken. I've read and heard about so many different stories that I can't keep them straight. I'd still like to know what people usually call this point. I know where you are talking about. I've been out there. Don't know the name though. Never heard any name for it ever. But now have the wife talked into going out the other other one too. For those that have been.... was able to squeeze thru the slightly spread apart gate. Of course do at your own peril. OK. I had thought that the walk through the main tunnel along the sidewalk was now forbidden. I guess that I'm wrong....though it never looked very attractive after seeing some of the way-out side mirrors that the self-propelled motor houses use. Those mirrors are bicycle swatters, and you would be right next to them on that walk. I have never looked closely at the gate on the side tunnel. Will have to do that. As for the death, I seem to remember that, too. It would be in the "Death in Yosemite" book. I should have bought a copy, but there is in our local library. I guess some things are unclear. The "other" tunnel is the tunnel near Tamarack and Cascade Creek on Big Oak Flat Road. 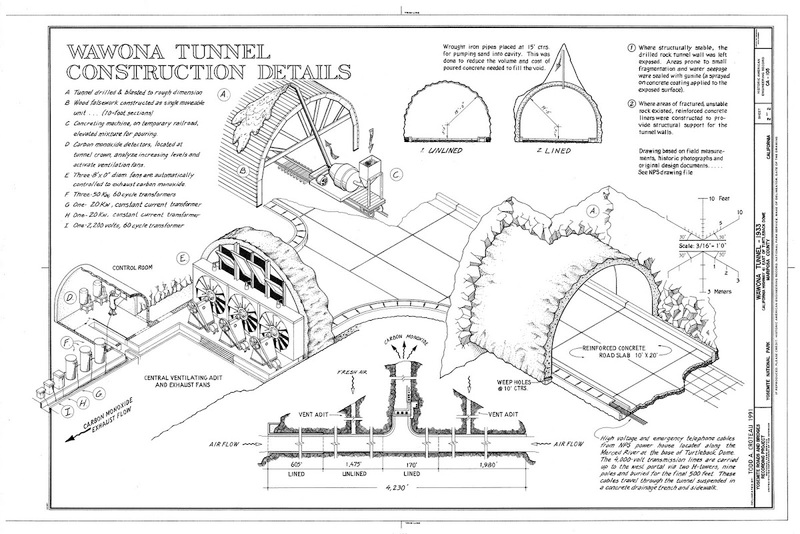 The "other other" tunnel is The Wawona Tunnel. The two pictures were taken from the side tunnel on the "Big Oak Flat Tunnel". Both pictures show The Rostrum and Bridalveil. The second is a zoom of those. rock flake which is at about a 45 degree angle atop it. going that nuts and scraping the side of the tunnel. Wow. I somehow had it in my head the whole time that you were talking about the side shaft on the Wawona Tunnel. It has been gated for years. I didn't know there was a side tunnel on the north side of the river. It's interesting that BOFR side tunnel and the Rostrum and Pulpit Rock and Bridalveil Falls all line up like that. Thanks for displaying that line on the map. Edited 1 time(s). Last edit at 11/14/2011 07:57PM by wherever. The incident I was referring to happened @ Wawona Tunnel, not the one on BOF. Don't know why I got the facts mixed up. Maybe I was thinking of the incident near Cascade Creek Falls and somehow thought it happened in the north-side tunnel. Or maybe it just never occurred to me someone could fall from as high as 350 feet from the tunnel view, and I've seen the drop at the "other" tunnel. Speaking of views from the tunnel, I see now that the YExplore crowd show a photo from that side tunnel of the BOFR tunnel #3. They also imply that you can get to a lookout from the Wawona Tunnel, but I'm skeptical about whether they succeeded. Twenty years ago the Library of Congress collected some photos of historic tunnels and things. For BOFR tunnel #3, all that the guy photographed was the two entrances. But for the Wawona Tunnel, he did a bit more. Here is a view taken from the lookout from the central side tunnel. That's the big side tunnel with the fans and control room. In the middle foreground is the location of BOFR tunnel #1. Tunnel #2 is below the west end of the big cliff farther up the road. So there is at least a pretty good lookout from the main Wawona side tunnel....if you have the key to get in. Awesome stuff. Thanks. Next time thru Wawona Tunnel I'll take a look-see and see if worth exploring. Next time thru Wawona Tunnel I'll take a look-see and see if worth exploring. door was locked and didn't try to open it. The two side. Not gated. As with the "other" tunnel, there are no signs that say 'no pedestrians'. read a large CO count. and from the other side down Turtleback (N of 41). at 140/BOF junction and took some pix. Edited 1 time(s). Last edit at 11/27/2011 02:06PM by chick-on. Of course I would be interested in the pics. So there is at least a pretty good lookout from the main Wawona side tunnel....if you have the key to get in. The last time I was there, in the Fall of 2010, the Wawona side tunnel closest to the Tunnel View parking lot was not gated closed. That was also my experience, although not quite as recent. That's definitely the Rostrum and NOT Pulpit Rock. These were taken almost exactly where that 'click' is on the map above. Yup. Of course I remember your photos along with your g/f's at the Renaissance exhibit. exhibit... ". Thought you might get a kick out of it. Old Coulterville along with a nice view of the rock falls off of Elephant rock. The same view is not seen from the lookout pt. east of the tunnel. At least I don't recall it. in the morning... and usually make haste on the way out. So could be mistaken. She just submitted for this years. FAR better quality shots this time around, methinks. How's that LX5 treating ya? I like it. Don't love it. I'm sorta in love with the super zoom of the Z7. So now I'm carrying two cameras around. should always be to show it's splendid backcountry more. The ZS7 is a fine camera, no doubt. The LX-5 can only really be loved (IMHO) when used shooting in RAW and w/full manual mode. This year I'm hoping they don't give out awards to novelty pics like last year w/that shot of the Photoshopped "See America" RV over a shot of the valley. Ridiculous.